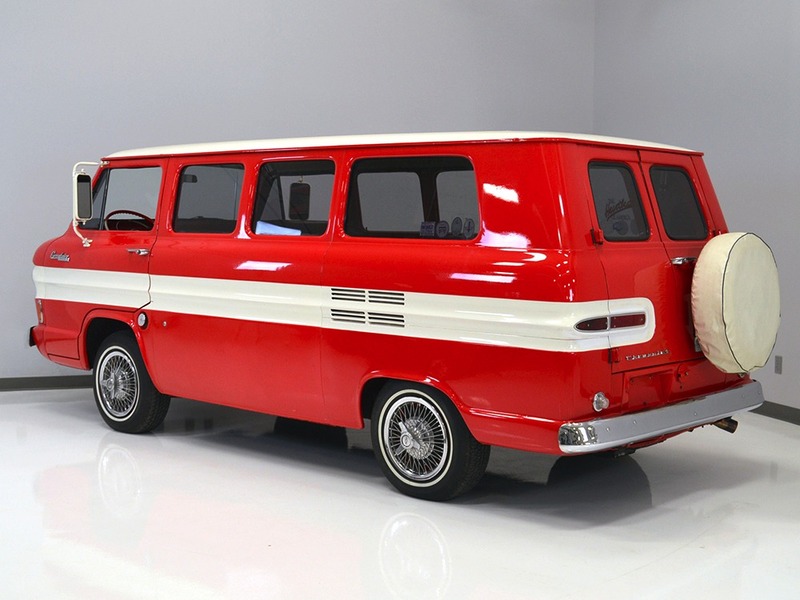 Look, if you can’t have fun in this 1961 Chevrolet Corvair Greenbrier Sportwagon, you’re doing something seriously wrong. From the bright color combination to the wonderfully useful interior to the funky yet reliable air-cooled powertrain, it’s an unusual and affordable way to get a lot of attention at car shows. The Greenbrier was only produced from 1961-1964, and when the redesigned Corvairs hit the market, the Sportwagon sadly disappeared. Most were commercial-grade panel trucks that were used up and thrown away, and many others were used for family transportation. Today they’re rather rare and the chances of seeing another one at a show are quite remote. Fully sorted and ready to enjoy, this is a great way for a family to enjoy the old car hobby and see the countryside, all at an extremely affordable price. 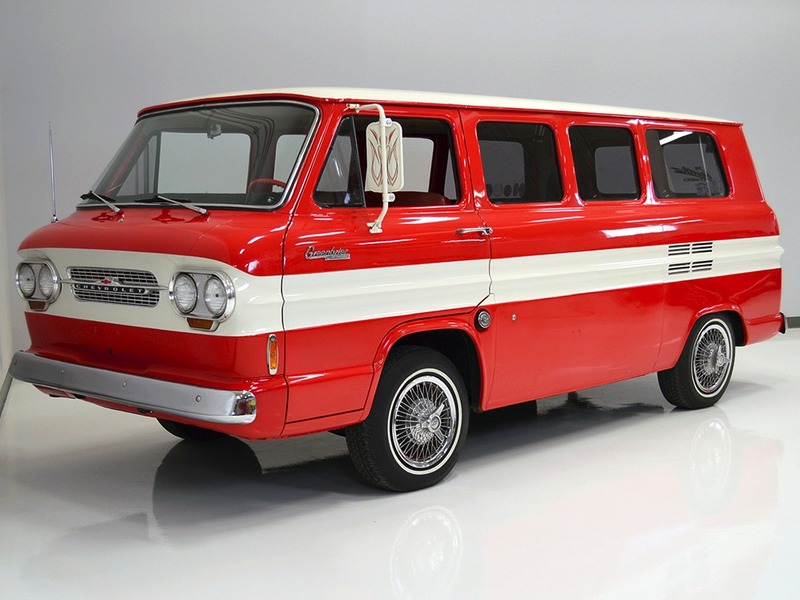 The two-tone Cardinal Red and Cameo White paint combination is this van’s original combination, and all Sportwagons came with the contrasting stripe running through their centers. The previous owner spent quite a bit of effort touching up the paint (apparently it arrived at his home with two different shades of red on its flanks) and today it looks great. Is it show quality? No, but this has obviously always been a nice, clean Corvair that has led an easy life and has probably been restored as needed. The bodywork is straight and clean, with doors that fit well and you already know there are no replacement aftermarket body panels, so that’s factory sheetmetal throughout. The blending of the paint was quite well done and it’s almost impossible to see where the fresh paint was applied, and it all has a very uniform look. There are a few touch-ups in the white areas that aren’t quite as expertly blended, but you’ll have to look pretty hard to find them. It also offers nice chrome bumpers, crisp ‘Greenbrier’ emblems, and a jaunty spare tire mounted out back. You’ll also find some pinstripe work on the oversized side mirrors, which are pretty nice to have when maneuvering in tight spaces. The two-tone red and white interior is big enough for nine passengers and all their stuff, and the upholstery appears to be the upscale “Deluxe” trim. I would guess that the upholstery has been replaced at some point, since it’s just too nice to be 55 years old, but it has a nice patina that works rather well with the rest of the van and it’s important to note that it actually looks better in person than in photos, as the flash tends to magnify all the flaws. The front carpet is a deep pile that belongs in your living room, not your Corvair, but it’s professionally finished and bound around the edges, so it fits well and looks decent under a red rubber mat. The instrument panel is from a later Spyder (turbo) model, and includes a cylinder head temperature gauge, but it doesn’t appear to be hooked up. All the other gauges, however, are fully functional. There’s also a later AM/FM/cassette stereo and even a ‘70s 8-track player underneath, and it plays through a set of speakers mounted under the dash and in the back D-pillars that fill the interior with sound. A big switch on the steering column controls an electric fuel pump for cold starts, but it isn’t needed once the engine’s running, and a Corvair expert informs me that the horn ring is from a ’65. Twin rear benches are in equally good condition, flanking a removable table with a US map on its surface, and the carpet back there is a short nap that may also be from a home store but fits well and presents no issues. The little map lights above the table and in the cargo bay all work properly and there’s a heavy-duty rubber mat to protect the floor in back. The engine appears to be from a 1964 Corvair, as it offers a 1964-only fan belt guard and forward-mounted dipstick, as well as an alternator instead of a generator. The engine bay is tidy if not detailed, and it runs superbly. A bit of priming from the electric pump and it fires right up without a lot of drama, and after getting up to temperature, it’s smooth and easy to drive. The air-cooled flat six makes 90 horsepower from 145 cubic inches, and the Corvair’s durability and reliability are legendary. Parts are still plentiful and there’s a lot of knowledge out there to keep it in top shape without an engineering degree. The two-speed PowerGlide automatic transmission works properly, shifting at about the moment you start to think it won’t, and it happily cruises at 55 MPH without seeming to work very hard. Brakes are firm and reassuring while the suspension rides like a luxury car, not a truck, gliding over rough pavement without disturbing the folks in back working at the table. Heck, this one’s not even a leaker! It’s fitted with original steel wheels that have been painted to match the bodywork, as well as a set of 195/75/14 General whitewall radials that are just the right size. Original wire wheel covers are a little pitted and rough, with one missing an “ear” on its spinner, but replacements are easy to procure or perhaps consider an upgrade to factory Rallys or something like that to really make it look sporty. We here at Harwood Motors have quickly discovered that we really like this Greenbrier. Everyone who sees it smiles and now that we’ve driven it a bit, its user-friendly nature and awesome practicality make it a favorite. If you like unique, affordable, and easy-to-maintain collector cars, you won’t find many better than this. Call today!